The PHCN-961/962 series of pH controller and transmitter provides a reliable method of monitoring and controlling pH in water treatment, electrolytic water cleaning, chemical industry, food process, cleaning water or wastewater treatment and neutralisation processes. 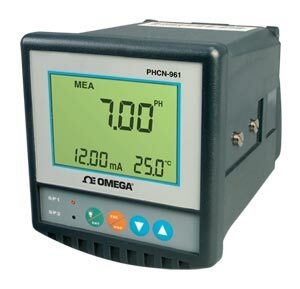 The controllers standard features include a digital display capable of displaying pH readings between -2 and 16 pH or ORP readings between -2000 an 2000 mV. Additional features include temperature, and status of relays, adjustable dual alarm set points, dead band adjustments of 0.01 to 2 pH of the set point, and menudriven program to set up pH or ORP calibration. The PHCN-961/962 is a basic pH or ORP controller, it includes an IP65 (NEMA4X) enclosure, digital display, two separate set points for high and low alarms, adjust dead bands, three 1 amp SSR. Accepts one pH or ORP electrode input through supplied pH transmitter. Note: *When ordering the pH meter, it is recommended to purchase pH buffer solutions, such as PHA-7, pH buffer 7. Comes with complete operator's manual.